Colombia’s presidential election has headed to a runoff after conservative candidate Ivan Duque, a critic of the landmark peace deal with FARC rebels, took the lead in the first round but failed to secure an outright majority. With almost all polling stations reporting the results on Sunday, neither candidate succeeded in obtaining the 50 percent threshold needed to avoid the runoff, which will be held on June 17. Duque, 41, a right-wing candidate from the Democratic Center Party, came in first after bagging about 39.1 percent of the votes. 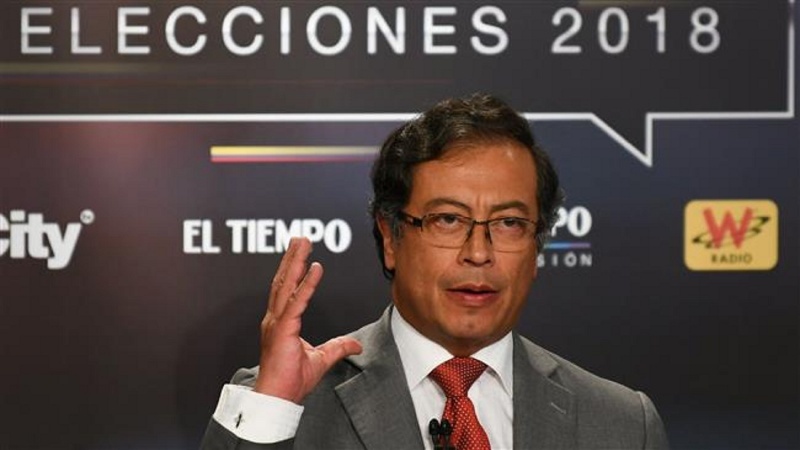 He will face runner-up Gustavo Petro, 48, a leftist from the Progressivists Movement, who finished in second place with around 25.1 percent of the ballots. Business-friendly Duque has promised to cut corporate taxes and support oil and mining projects. He has also pledged to toughen the terms of the peace deal, which was signed in 2016 between the government of President Juan Manuel Santos and the Revolutionary Armed Forces of Colombia (FARC) and ended a five-decade conflict. The politician said as president, he will ensure that the former FARC rebels pay for their crimes. Meanwhile, Petro, who comes from poor roots and has a history of militancy, sent jitters among the rich with pledges to overhaul Colombia’s capitalistic economic policy and redistribute wealth. Petro has also been far more supportive of the FARC deal compared to his rival. The eventual success of that deal will depend greatly on who wins the election.